Who loves plants? 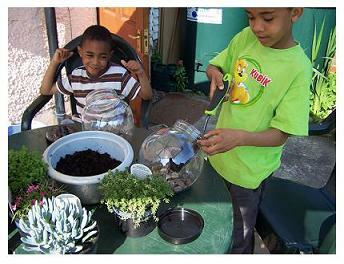 If you do the plant terrarium will be a fantastic nature craft for you to get your hands dirty. But what is it? A garden in a jar! So get your pen and note down what you are going to need to create this mini haven. The garden center sells all you need for your project. You may find some sort of container for your plant terrarium but if you look around the house you may be inspired. We looked around Ebay and found some sweety jars. Lovely! Just the right size for us and a wide enough opening to make the craft easier. Off to the garden center we went and after a long long walk around, and a quick look-in on the fish there, we came out with 4 plants that suited the project. We chose Milloides Claret (Rhodohypoxis) the pretty little center plant with the pink flowers, Serpens (Senecio Klienia) that`s the cactus-looking plant on the left, Coral Carpet (Sedum) the plant to the right which will turn several shades of pink, hopefully! As for the plant at the back, we haven`t got a clue what it is because we lost the marker label. 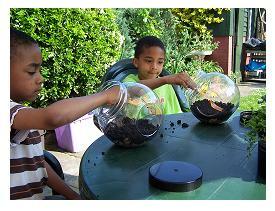 So here are the crew, Iain and James getting their hands dirty preparing the jars for the plants. Do this outside, because if you don`t, your parents are going to be mad at the mess. We chose the garden table as you can see and were under the sun shade. kooool! Get a garden trowel and a dinner fork to work with. 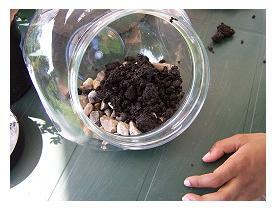 First you must put some stones in the bottom so your plants can have some drainage. Add the charcoal if you were able to find it. It will help keep any bacteria at bay and will also help with water drainage. Then you can add your soil using the trowel. You can bank it up at the back but don`t go higher that the opening. Think of how you want your plant terrarium to look. Do you want it to be a mini rock garden? If you choose to do that then think of placing the rocks as you put each plant in place. Once you get the soil in, take the dinning fork and rake out any lumps in the compost. Iain and James did this very well but needed assistance to get the plants in. We got a bit worried when we took the plants from their pots. The root balls were tight on a couple of the plants. Not to worry! Just ease them apart and try not to damage them as much as possible. Where is The Right Spot? Our choice of plants had different heights so we put the unknown plant to the back as it was the highest. By the way all these plants like full sun or full and partial sun. You need to check that out when buying them. We put the pretty Milloides Claret in the central spot because it was so pretty and a nice height. And the two succulents went to both sides. Perfect! Time to water, but make sure your plants are firmly placed with as much of the root covered as possible. Do you have any pretty stones to make it into a rock garden? You can put them in now if you like. 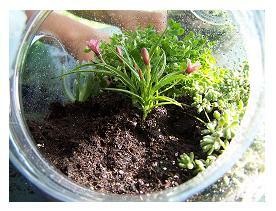 When you water a plant terrarium you don`t get the watering can and pour a gallon of water in. We are not making a sea anemone aquarium! No! 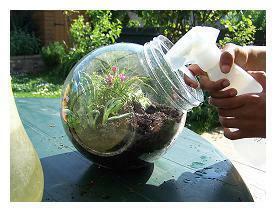 You gently water it with a mist, and you need a spray bottle for that, like in the picture. We want to keep our lid on sometimes, just to generate some humidity, but leave it off otherwise to keep it from getting moldy. It`s our first time so we are just testing this out to see if our plants will like it. Now if they look like they are wilting or turning a funny color.....! The plant terrarium was fun to make. For more great ideas return to the nature crafts page. Or what about a butterfly garden?